Attention all wine drinkers! This one’s for you. If you’re a wine-o, then your New Year resolutions list probably looks something like this: add more V. Sattui Winery to my life! Pretty accurate, right? You might have heard of this one before, and you’ve probably thought to yourself, “I really want to do this,” but still haven’t acted on it. Well, now that experiencing one of these popular pairings is on your resolutions list, let’s make it happen for you! This is way more than just a food pairing. Firstly, you are greeted by your host with a glass of our sparkling Prestige Cuvée and taken on a guided tour of our estate Vittorio Vineyard and production areas. You then make your way down to the underground barrel aging cellar where your preset seating pairing awaits at our long Italian tables. What happens next is magic. Our wine expert will lead you through six mouth-watering seasonally-inspired culinary creations paired with six highly-awarded V. Sattui wines as you are educated on the flavor dance between fats and acids, salt and sweet, complements and contrasts. Step away from this experience understanding how food and wine improve when paired properly. Reserve your seat now for February 16 or March 16 from 11 am – 1 pm and cross resolution number one off the list! When you take a tour of V. Sattui Winery, you immediately become part of the family. Our welcoming and edu-taining hosts dive into our rich history while you discover your soon-to-be favorite V. Sattui wines all while taking in the Tuscan beauty of the property, estate vineyards, and manicured grounds. During the tour, you will learn about our winemaking practices, the Napa Valley Agricultural Preserve, and what it means to be a responsible steward of the land along with the rebirth of the winery following Prohibition. At the end of the tour, guests will be treated to a full complimentary tasting! Daily tours take place daily: Monday through Sunday; reservation required (resolution encouraged). If you’ve read our previous Cabernet Season blog, you’ve heard of this one. Now you actually have an excuse to experience it for yourself while it’s on your resolutions list. The next time you come by the winery, be sure to upgrade your tasting to this one-of-a-kind seasonal experience. Your favorite junk foods paired with award-winning Cabernets — it’s a match made in heaven. This isn’t the only unique upgraded cabernet experience we’re offering either, the options are endless! Resolution Number 4: Eat More Cheese! Now this one’s easy! 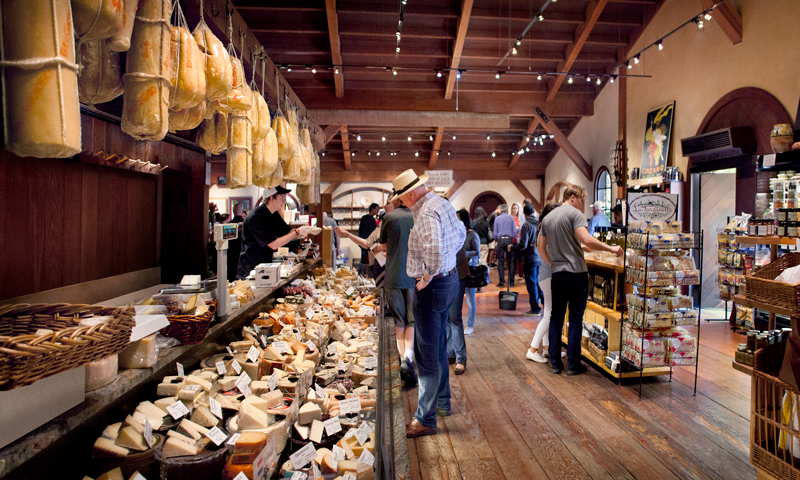 With over two hundred cheeses from all over the world in our Artisan Deli, you can fulfill this resolution all year long. Grab the crew, your favorite bottles of V. Sattui wine, as many cheeses as you can carry, and picnic right on the property. Our on-site cheesemonger will help you pick the perfect pairings. And for dessert, treat yourself to homemade tiramisu, crème brûlée, seasonal fruit tarts, or our own Italian-style gelato. It’s a new year, so why not indulge? Resolution Number 5: Drink More (V. Sattui) Wine! This one might be the most important on your resolutions list this year. It’s important to take time for yourself, relax after a long day, and enjoy a glass (or two) of your favorite V. Sattui wine. Even better – share it with friends! We offer a variety of wine clubs to fit your liking, making it easy to drink more wine at home all year round. The best part, it’s delivered right to your door! Membership perks include invitations to the best parties in the Napa Valley. In fact, Lobster Fest is just around the corner and sold out six weeks in advance last year! Lock in your membership now to get your invitation to this member-only event. Be sure to also check out our wine specials throughout 2019 as we are always offering amazing deals on our award-winning wines! As you cross these resolutions off your list in the New Year, be sure to share your experiences with us and tag us on social media! Cheers to 2019!